The courses aim to provide comprehensive training in the design, conduct, and analysis of clinical and non-clinical health research and to interpret and use findings from such studies for patient care and policy making. We also teach students how to write professional reports and scientific research papers. This programme emphasis on clinical epidemiology and interpretation of epidemiological research results, the courses are also particularly popular for those who wish to master critical appraisal skills for evidence-based medicine. We offer different programmes of study to cater to the varying needs of our students. 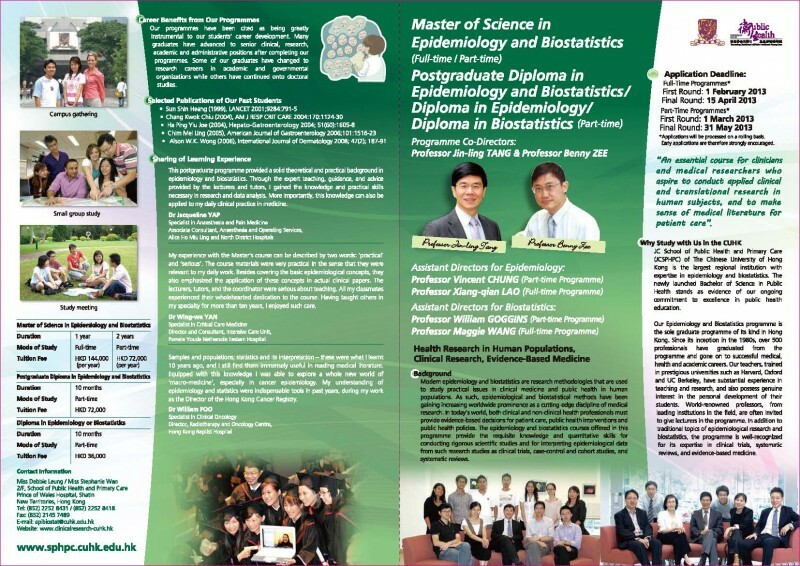 The Diploma programme allows more flexibility and only requires attendance in either biostatistics or epidemiology courses. The Master of Science (MSc) programme extends learning to a broader range of topics and involves more in-depth discussions. MSc students are required to conduct an independent research project under supervision and produce a thesis of publishable standard before graduation. Some students’ work has resulted in publications in major medical journals, such as Lancet, Cancer, and Chest.